A water main break under the northbound lanes of the Indian Head Highway has caused the Washington Suburban Sanitary Commission to issue a boil water advisory for areas of southern Prince George's County, Maryland. WSSC said Sunday evening that a 36-inch main that runs under the northbound lanes of Route 210 broke in two places. Video of the water main break shows water shooting up several feet high into the sky like a geyser. The boil water advisory will likely be in effect until Tuesday afternoon, WSSC told News4. 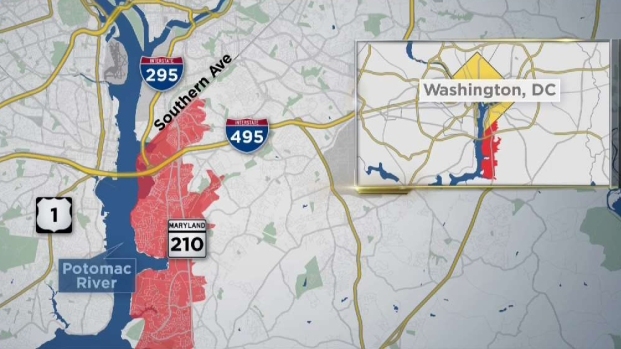 Residents in Fort Washington and National Harbor are advised to bring their water to a rolling boil for three minutes before using it for drinking, brushing teeth or washing fruits and vegetables. 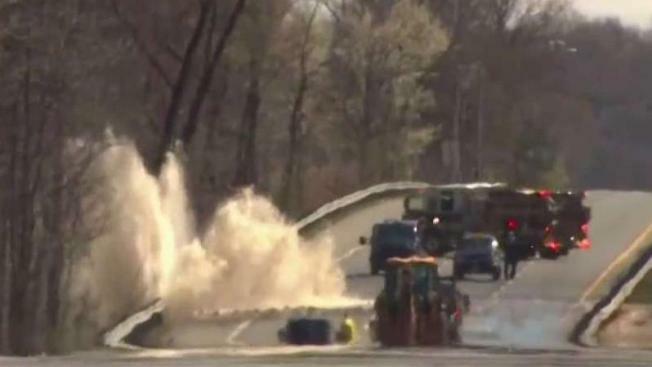 A 36-inch water main break forced closures of the northbound lanes of Indian Head Highway in Fort Washington, Maryland while also prompting a boil water advisory in Prince George's County. "All stored water, drinks or ice made recently should be discarded," WSSC said in a news release. "Boiled water can be stored in a clean container with a cover. Water does not have to be boiled before it is used for bathing as long as it is not consumed." You can check to see if your neighborhood is affected using this interactive map. The advisory will affect about 23,000 WSSC customers west of Route 210 to the Potomac River. The advisory is a preemptive measure after the main break because of a drop in water pressure, WSSC said. "When this occurs, there is an increased risk of contamination to the water distribution system," WSSC said. Northbound lane closures lasted overnight and into the morning rush hour between Old Fort Road and Fort Washington Road. The left lane was opened to traffic ahead around midnight.